In any one hospital, thousands of medications are administered to patients each day. Errors in this process are frequent.1–3 Over the last decade, there has been a steady increase in the number of studies reporting interventions designed to reduce interruptions to nurses during the preparation and administration of medications.4–6 These interventions are based on an underlying assumption that interruptions are significantly associated with medication administration errors (MAEs). Thus by reducing interruptions, these interventions are designed to result in fewer MAEs and less harm to patients. One study demonstrated a direct positive association between interruptions to nurses and the frequency and severity of MAEs in two hospitals,1 adding weight to the argument that reducing interruptions may also reduce error rates. A systematic review4 of interventions designed to reduce interruptions to nurses during medication administration however demonstrated that despite increasing reports of such interventions there is limited evidence of their effectiveness to reduce interruptions or MAEs. The review identified key methodological limitations of previous studies including no randomised controlled trials to assess intervention effectiveness; a reliance on self-reported outcome measures which are subject to bias; small sample sizes; limited detail regarding the nature of interruptions recorded (ie, whether they were related to the medication task or not); a failure to define ‘interruptions’; an absence of inter-rater reliability measurement when multiple observers were used; observers who were not independent from the study sites; and limited statistical analyses including a failure to account for clustering by ward. Introducing ‘Do not interrupt’ interventions has considerable work process and resource implications and may also result in unintended consequences.7 Thus, evaluations of patients' and nurses' experiences of such interventions are important in determining the acceptability and likely sustainability of such interventions. Interventions need to account for those interruptions that are necessary and integral to the medication administration process5 and target the reduction of interruptions that are unnecessary to the immediate safety critical task. administer a survey to assess nurses' experiences and their views about participating in the study and the intervention. We conducted a parallel eight cluster (four medical and four surgical wards) randomised controlled study at a major 650-bed teaching hospital in Adelaide, Australia. The hospital used paper-based prescribing and medication administration processes. Eight nurse managers provided guardian consent for their wards to be enrolled and randomised. All nurses, excluding agency staff, were invited to participate and 227 (79%) consented. Nurses were informed that the study was a direct observational study of medication administration and preparation tasks. Nursing staff were blinded to the study aim focused on interruptions and at baseline were blinded to the intervention. Only intervention ward staff were informed of the intervention subsequently. A cluster design was selected to allow intervention implementation by ward to minimise contamination. Randomisation was conducted by two researchers (LL and JW) independent of the data collection. Wards (clusters) were stratified by type (medical or surgical) with a 1:1 allocation. Two wards of each type were randomly selected to receive the intervention following baseline data collection. We aimed to randomly collect observational data on 300 individual medication dose administrations per ward in each of the baseline and postintervention periods. The study was not powered to detect a difference after intervention between the two study arms as neither the size of the intracluster correlation coefficient (ICC) nor the likely intervention effect size was known. Ethical approval was obtained from the Hospital Research Ethics Committee. The ‘Do not interrupt’ intervention, comprising five ‘bundled’ elements, was administered to the four wards randomised to the intervention and consisted of (1) wearing of a ‘Do not interrupt’ medication vest by nurses when preparing and administering medications; (2) interactive workshops with nurses regarding the purpose of the intervention to reduce non-medication-related interruptions and to identify local barriers and enablers to intervention use (eg, where to store vests); (3) brief standardised education sessions with clinical staff (eg, doctors, allied health); (4) patient information, which included why nurses were wearing a vest, and a request not to interrupt nurses during medication administration unless their concern was serious and urgent, or related to their medication. Patients were informed of other nurses and staff from whom to seek help if required, and (5) the use of reminders such as posters and stickers to inform health professionals, patients and visitors not to interrupt nurses during medication rounds for safety reasons. Nurses on intervention wards were required to wear a disposable red plastic vest (see online supplementary figure S1) for medication preparation and administration. The vest served as a visible signal that a nurse was administering medications and should not be interrupted. The wearing of vests became ‘business as usual’ regardless of whether individual nurses had consented to be observed as part of the study, that is, all nurses on the intervention wards were required to wear a vest during all medication rounds. Education was provided by the study project manager to intervention ward staff over a minimum of three sessions across a 3-week period. Information leaflets were addressed to individual staff on the four intervention wards to explain the intervention. Notices were placed in central locations and all individual patient drawers and medication cabinets on the intervention wards. A separate information leaflet was prepared and distributed to patients and relatives admitted to the wards. At the completion of the study, nurse participants were invited to complete a structured survey seeking their views about study participation and being shadowed by an observer; the intervention and its impacts on time to administer medications and interruptions; and whether they would support ongoing use of the intervention. Response categories used four or five-point Likert scales (eg, strongly agree to strongly disagree) or yes/no. The survey is available from the authors on request. Observations were conducted at the individual medication dose administration level. The primary study outcome was rate of non-medication-related interruptions per administration and secondary outcomes were total interruption and multitasking rates per administration. Interruptions were defined as ceasing a current task to respond to an external stimulus (eg, a question, alarm). Non-medication-related interruptions were those whose content did not relate to the specific medication tasks being undertaken by the observed nurse. For example, if an observed nurse is attempting to administer a drug to patient A and is then interrupted with a request to double check a drug for patient B, then that interruption is categorised as a non-medication-related interruption as it does not relate to the primary medication task of the observed nurse. Table 2 provides a listing of the major subcategories of such interruptions. Multitasking was defined as performing two tasks in parallel, for example, preparing a medication while answering a question.8 Medication administration was defined as the preparation and administration of one dose to one patient. Nurse characteristics (eg, classification—registered nurse, enrolled nurse), ward (ie, medical/surgical) and details of all medication administrations observed were recorded (eg, route—oral, intravenous/injection or other). The type of interruption (medication related or not), physical location (eg, bedside, medication room, corridor) and source of interruption (eg, nurse, patient) were also recorded. In the postintervention period, observers also recorded whether or not nurses on the intervention wards used the vest during each administration. Multitasking was measured to allow comparison with previous studies that included multitasking within their definition of an interruption. All data items were automatically time stamped by the data collection software. Observers collected data in real time using the Work Observational Method by Activity Timing Software (WOMBAT)9 on a tablet computer. Descriptive statistics were calculated for interruptions, administrations, interruption rates by study group (control vs intervention) and study period (preintervention and postintervention) and survey responses. Based on the intention to treat principle, analyses were conducted at the individual medication administration level and all observations were included. Multilevel negative binomial modelling was used to estimate the non-medication-related interruption rate (dependent variable), changes between intervention and control wards over preintervention and postintervention periods (interaction term between study period and study group), considering the correlation of administrations occurring in the same ward (cluster) and also taking into account overdispersion (ie, variance is significantly larger than the expected value). Other independent variables, including ward type and medication route, were controlled for in the models. ICCs were calculated based on the model. The same analyses were conducted for the secondary outcomes, that is, overall interruptions and multitasking events. Results for all interruptions, as well as for non-medication-related interruptions, are presented to allow comparison of our findings with those from published studies where this distinction in type of interruption is rarely made, and to assess the likely consequence of this aggregation on conclusions. Results with and without accounting for clustering are also presented to allow comparison of findings with published studies, none of which have controlled for these factors. For the survey data, descriptive statistics by study group, including frequency and percentage, were presented for each survey question. Significance was set at p<0.05. Data analyses were conducted using SAS V.9.4. Over 364.7 observation hours, 227 nurses were observed administering 4781 medications. At baseline across the eight wards, we observed 1393 interruptions during 2429 administrations (57 interruptions/100 administrations). The majority were non-medication-related interruptions (87.9%, n=1224, 50/100). Control and intervention wards experienced similar baseline interruption rates of respectively 51 and 50 non-medication-related interruptions/100 administrations. 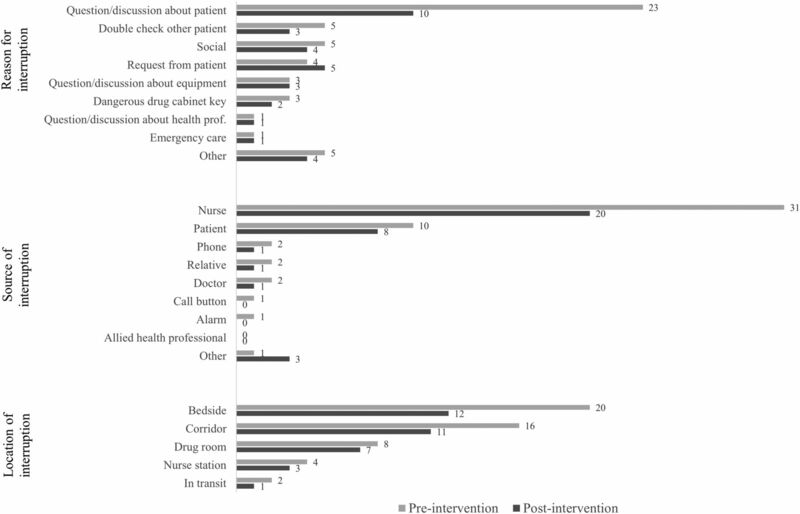 On both control and intervention wards, nurses were interrupted by non-medication-related issues once or more in around one-third of medication administrations (32.1%, n=387 in control and 32.1%, n=393 on intervention wards) (table 1). The most frequent reasons for non-medication-related interruptions were questions or discussions about other patients. The majority were from other nurses and occurred at the bedside (table 2). In the postintervention period, nurses on the intervention wards experienced a significant reduction in non-medication-related interruptions from an average of 50/100 administrations (95% CI 45 to 55) to 34/100 administrations (95% CI 30 to 38). Nurses on the control wards experienced no significant change (51/100 administrations preintervention; 95% CI 46 to 56 vs 53/100 postintervention; 95% CI 47 to 58) (table 3). Without considering the cluster design, the non-medication-related interruptions in the intervention wards decreased by 17/100 administrations compared with the control wards (p=0.0001). After controlling for clustering, that is, administrations occurring in the same ward, and adjusting for ward type and medication route using the multilevel negative binomial modelling approach, there remained a significant reduction in non-medication-related interruptions on the intervention wards compared with control wards (a reduction of 15 interruptions/100 administrations; p=0.01). The ICC based on the model was 0.01. Of 1177 administrations observed on the postintervention wards, for 92.6% (n=1090) nurses were observed wearing vests. In 2.0% (n=24), nurses wore the vest for part of the process and in 5.4% (n=63) of observations no vest was worn. On the intervention wards, we observed reductions in the rates at which nurses administering medications were interrupted by other nurses (31/100 administrations preintervention to 20/100 postintervention), particularly with questions about other patients (from 23/100 administrations preintervention to 10/100 postintervention) (figure 1). There was a small reduction in the rate at which nurses were interrupted to double check a medication for another patient (figure 1). We found reductions in the rates at which enrolled nurses (preintervention 8/100 administrations; postintervention 3/100) and registered nurses (preintervention 21/100; postintervention 15/100) interrupted other nurses. There was little change in the rate of interruptions from patients. Postintervention the rate of non-medication-related interruptions at both the bedside and in the corridor substantially decreased on the intervention wards (figure 1). Rates of non-medication-related interruptions per 100 medication administrations by reason, source and location on the intervention wards before and after the ‘Do not interrupt’ intervention. In the postintervention period, nurses on the intervention wards experienced a reduction in interruptions from an average of 56/100 administrations (95% CI 50 to 62) to 38/100 administrations (95% CI 34 to 43). Interruption rates on the control wards experienced little change (59/100 admissions; 95% CI 53 to 64 preintervention vs 57/100; 95% CI 52 to 63 postintervention). Without considering the cluster design, a direct comparison of the change in total interruption rates between the intervention and control wards before/after the intervention showed a significant reduction for the intervention wards relative to the control wards of 16 interruptions/100 administrations (p=0.0005). Accounting for the randomised cluster design, the difference disappeared (p=0.4; a difference between intervention and control wards of 13 interruptions/100 administrations). After adjusting for ward type (ie, surgical vs medical) and medication route, there was no significant difference in the change in interruption rates before and after the intervention versus control wards (p=0.07; intervention wards had an average of 12 interruptions/100 administrations fewer than control wards). An ICC of 0.01 was obtained from the model. In the postintervention period, nurses on the intervention wards experienced a reduction in multitasking from an average of 487/100 administrations (95% CI 460 to 513) to 435/100 administrations (95% CI 407 to 463). There was little change in multitasking rates on the control wards (462/100 administrations in preintervention; 95% CI 436 to 488 vs 470/100; 95% CI 443 to 497). Without considering the cluster design, multitasking on the intervention wards significantly declined (by 60/100 administrations) compared with control wards (p=0.02). However, accounting for the cluster randomised design, this effect disappeared (p=0.40). After adjusting for ward type and medication route, there was no significant change in multitasking rate on the intervention wards relative to the control wards (p=0.67). All 227 nurses who had consented to participate in the study were invited to complete a survey. In total, 88 nurses completed the survey (44 from intervention and 44 from control wards), a response rate of 38.8%. The vast majority strongly agreed or agreed that interruptions occur frequently (88.6%) are a concern for patient safety (86.2%) and lead to MAEs (81.6%). We asked nurses to indicate the frequency (on a four-point scale: frequently, sometimes, rarely, never) with which interruptions during medication administration arise from a list of 11 potential sources (eg, nurses, patients, alarms). The sources nominated most often as frequent interruption sources were as follows: patients (69.8% of respondents), call buttons (60%), nurses (51%), relatives (43%) and doctors (25.9%). We asked all nurses about their views of being observed during the study. The majority (60.2%, n=53) reported that being observed made no difference to them. A further 17.0% (n=15) responded that it made them ‘feel valued and/or important’, and 22.7% (n=20) that being observed made them ‘nervous and/or intimidated’. Overall, 53% (n=24 control wards, n=23 intervention wards) thought that being observed during the study had made them more aware of interruptions and 17.1% (n=15) that they paid more attention to medications. To identify the extent to which blinding of the intervention was successful, we asked nurses on the control wards if they were aware that ‘Do not interrupt’ vests had been trialled in the hospital and 29.6% (n=13) reported that they were aware of this intervention. Nurses on the intervention wards were asked about their experiences of the intervention. The vast majority (95.5%; n=39) reported that they wore a vest during the study when preparing and administering medications, and 52.3% agreed or strongly agreed that they thought the intervention was effective at reducing interruptions. Some (27.3%) thought that wearing the ‘Do not interrupt’ vest was associated with an increase in the time taken to administer medications, while others (20.4%) perceived a decrease and 40.9% no change. The majority of nurses on the intervention wards agreed or strongly agreed that the vests were too hot to wear (52.3%) and time consuming to put on and off (52.3%); 38.6% thought that the vests were cumbersome. Across the entire sample, we asked nurses if they would voluntarily wear the vests if they were provided (yes/no); 56.8% on the control wards indicated that they would (25% indicated no; 18% did not respond), as did 43.2% of those on the intervention wards (38.6% no; 18% did not respond). Similarly, when asked if participants would support the wearing of vests becoming hospital policy 52.3% of nurses on the control wards and 47.7% on the intervention wards indicated yes. While nearly all survey participants responded to all questions, we found that for these last two yes/no questions 18% (n=16 evenly split across intervention and control wards) did not respond; however, no option was provided for undecided. Using a parallel cluster randomised controlled study, we found a significant reduction in non-medication-related interruptions on the intervention wards compared with the control wards. Thus, the intervention was effective, but the effect size was modest representing a 30% reduction in interruptions (of 15 interruptions/100 administrations). This result is consistent with, but lower than, a range of small, non-controlled studies that report significant reductions in the overall rate of interruptions per medication dose administered of 71%11 44%12 and 43%13 following the introduction of similar interventions. Our lower effect size is likely attributable to our more stringent study design and analysis. Of note is an Italian study7 that demonstrated a significant increase in overall interruptions of 34%. A central question is, what is the clinical practical significance of this reduction in interruptions, particularly on error rate reduction? Drawing on findings from one of our previous studies1 which involved observation of 4271 medication administrations by 98 nurses across two teaching hospitals and demonstrated a significant dose–response relationship between interruptions and MAEs (n=1196),1 we can shed some light on this question. That study showed that each interruption was associated with a 12.7% increase in the incidence of clinical MAEs. Extrapolating from this finding, the reduction of 15 interruptions/100 medication administrations found in the current study would translate to a potential absolute reduction in clinical MAEs of 1.8% (95% CI 1.1% to 2.7%). To place this result in context, it is helpful to consider the effectiveness of alternative interventions also designed to reduce MAEs. The use of electronic medication administration records (eMARs) as part of a Computerised Provider Order Entry system (or e-prescribing system) is such an intervention. In a controlled before (paper-based medication administration chart) and after study of the introduction of an eMAR (with no bar coding) at a major teaching hospital, Westbrook and Li14 observed 4176 medication administrations performed by 153 nurses. At baseline, they showed the rate of clinical MAEs was 30.2/100 administrations. Following the introduction of the eMAR, there was a significant reduction in the clinical error rate of 4.2 errors/100 administrations (ie, a 14% absolute reduction in the MAE rate). Thus, our ‘Do not interrupt’ intervention has the potential to reduce MAEs by 1.8% versus a 14% reduction in MAEs found following implementation of an eMAR. Clearly, these two interventions are very different and involve substantially different resources. There are no published cost-effectiveness studies for either intervention types to guide decisions about their relative value. However, the contrast in magnitude of overall effectiveness in reducing MAEs highlights the value of considering opportunity costs when making decisions about any such interventions designed to reduce MAEs. Our finding of the high rate at which nurses are interrupted during medication administration (57 interruptions/100 administrations at baseline) confirms previous study findings across clinical settings and countries.7 ,22 ,23 Investigation of the nature of these interruptions revealed that the vast majority (88%) had no relevance to the medication task underway. Hence, there would appear to be considerable scope for reducing the cognitive load of these unrelated interruptions. The survey results revealed a high level of recognition by nurses that interruptions are frequent and that they are a risk to safety and contributor to medication errors. Thus, convincing nurses of the potential value of reducing interruptions appears unlikely to be a major barrier to change. This highlights the need to understand in more depth the reasons, context and motivations for the high rates of interruptions and the role they play in helping and hindering safe and effective care delivery. We found that our intervention was most effective at reducing interruptions from other nurses. The intervention had no substantial impact on the rate at which patients interrupted nurses, contrary to concerns that have been voiced in the literature that such interventions may inhibit patients from seeking help when needed.17 In an interesting study, Palese et al 24 investigated patients' interpretation of three different messages on ‘Do not interrupt’ vests and found that regardless of the message, patients on average expressed only modest agreement in terms of whether they thought that the do not interrupt message was directed at them (a mean score of 5.6 on a 10-point scale; 1=message on vest not at all directed at me, 10=message absolutely directed at me). We investigated several methodological issues related to the conduct of these types of interventional trials. We demonstrated that the use of a single-blinded cluster randomised controlled study was feasible and that blinding regarding the nature of the intervention for the control ward was relatively successful with 70% of control ward nurses indicating at the end of the study that they had not been aware of the ‘Do not interrupt’ vest being trialled. Direct observation is the most frequent and reliable method for assessing interruptions, yet there are always concerns that the process of observing may influence participants' behaviours consistent with the Hawthorne effect. We found that the majority of survey respondents indicated that when observed they did not feel any different, but around half reported it made them more aware of interruptions and a small proportion paid more attention to medication tasks. Both these later effects are likely to dilute the effect size of any intervention and further emphasises the importance of control groups in any study design. To date, the evidence base has relied almost entirely on uncontrolled before/after studies of intervention effectiveness, which have measured changes in overall interruption rates between wards. Our results showed that not controlling for clustering by ward can significantly affect study conclusions. For example, we found a significant decrease in overall interruption rates but once we controlled for clustering this effect disappeared. No previous study has controlled for such ward effects demonstrating the importance of our trial. There are some study limitations. First, it was conducted in one hospital and despite blinding around 30% of nurses on control wards reported that they knew that nurses on intervention wards were wearing vests. This may have influenced their own behaviours (though control wards did not have access to vests). Overall, around half of the surveyed nurses indicated that being observed made them more conscious of interruptions. Both these potential sources of bias would have diluted any intervention effects. Second, we had no detailed information about staffing levels, and while no large differences were apparent during the observational sessions we were unable to explicitly consider this factor in the analyses. Third, the impact of interruptions on MAEs and potential patient harm was not assessed in this study. We used published data from studies in similar Australian hospitals to estimate potential reductions in errors to illustrate the clinical effect size of the intervention. This approach is substantially more robust than previous attempts using incident reports to identify errors.4 Fourth, the response rate to the survey was <40% but was spread evenly across nurses on the intervention and control wards. Overall, these results reinforce the importance of applying rigorous study designs to assess the effectiveness of ‘medication safety’ interventions, particularly those requiring substantial work practice change and resources. The study of interruptions is complex and study designs to measure and assess their effects require equally sophisticated approaches.28 Decisions about the clinical value of ‘Do not interrupt’ interventions must be made in the context of whether there is a statistically significant reduction in interruptions and the potential clinical value of that reduction in relation to the resources the intervention requires and the likely acceptability and sustainability of the intervention.
. Administration of medication. In: Dean Franklin B , Tully M, eds . Safety in medication use. London: Taylor and Francis, 2016:35–44.
. Tips for learners of evidence-based medicine: 3. Measures of observer variability (kappa statistic). CMAJ 2004;171:1369–73. Westbrook JI, Li L. Changes in medication administration errors following the implementation of electronic medication management systems in hospitals. 30th International Society for Quality Assurance (ISQua) Conference; 2013; Edinburgh, Scotland.
. Interruptions during nurses’ drug rounds in surgical wards: observational study. J Nurs Mngt 2009;17:185–92.
. “I am administering medication-please do not interrupt me”: Red tabards preventing interruptions as perceived by surgical patients. J Patient Saf 2015;doi:10.1097/PTS.0000000000000209.
. How do interruptions affect clinician performance in healthcare? Negotiating fidelity, control, and potential generalizability in the search for answers. Intern J Hum Comp Stu 2015;79:85–96.